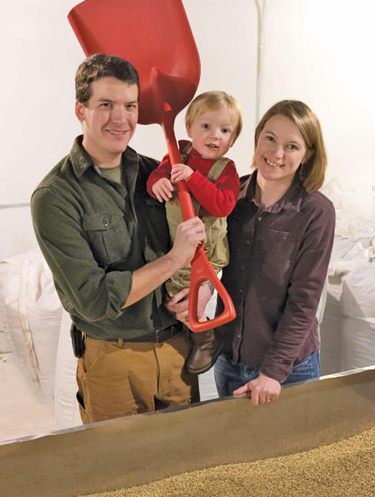 Zach and Megan Goldenberg, owners of Macon Creek Malt House, with their son Reuben Dean. Zach and Megan always dreamed of one day working together. Self-employed since before they met, Megan has been using her master’s degree in agricultural and natural resources economics to build robust and thriving food and agricultural systems across the country. Zach is a multi-talented, fix-anything kind of guy who is also working on a degree in electrical and mechanical engineering. And they both enjoy beer. After 6 years in the Navy, a brief stint at a steel mill, and the birth of their son, Reuben Dean, Zach decided it was time to turn that dream into a reality. Of all the business ideas they considered, a malt house made the most sense. In 2015, they established Macon Creek Malt House in Megan’s hometown — Saline, Michigan. Zach has designed and built all of the malting equipment from scratch and now drives innovation, product development, production, and quality control. Megan manages day-to-day activities, contracting with farmers and filling orders. A true family business, Reuben Dean specializes in Public Relations and occasionally “manages” the office with his dog, Dublin. Austin Wertheimer joins Macon Creek Malt House. A new arrival in 2017, Austin Wertheimer assists with production, research, and general mystery and intrigue. He has previously worked on a vegetable farm, in a grants management office, and with Megan at New Growth Associates. Austin hopes to continue his work towards a more localized, sustainable, and equitable food system by gaining more hands-on experience in more aspects of the food system.